In addition to his normal toys Alex also has two robots. These robots are called Alex I and Alex II and can only be played with together with his dad. The first robot is a balancing robot (which I found on Kickstarter). It drives around on two wheels trying hard to not fall down. Even a little poke from Alex does not bother the robot and it will keep its balance. 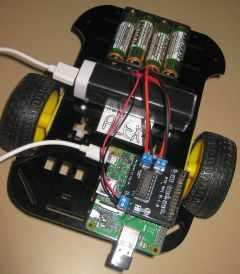 The robot can be programmed by using a simple programming language (blocks), and then sending the program to the robot using its USB cable, but this is something we’ll maybe try in the future. The second robot is a bit simpler and just drives around. It does have an entire computer on it’s back, which can be controlled via wifi and my phone. 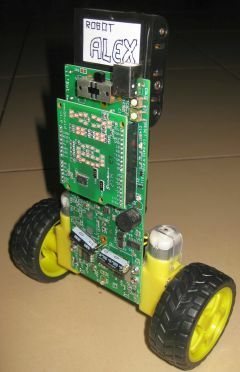 This robot as got some software set up to move about, and much more features can be added as phyton programs. Alex has these robots because I think is it very benificial for him to get in touch as early as possible with something that will be everywhere in his future. Alex his current robots remind me of the computers I had when I was young. Slow, huge and with a black and white screen. After taking a long time to boot all you would get was a prompt, and that was it. Internet didn’t exist and was still a thing of the future. Alex’ robots are far more advanced that my old computers and cost a fraction. They will advance extremly fast for sure and in a few decades Alex will look back at these things as I look back at my old PC’s. This entry was posted in Hobby by ajebe. Bookmark the permalink.